Glory Days Grill is a sports themed American grill and bar that combines an award winning menu of freshly prepared appetizers, desserts, and entrees with entertainment that appeals to all ages. Each restaurant has an abundance of televisions to watch the big game, news, cartoons or just about anything that's worth watching, along with the latest interactive games. 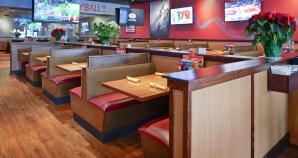 Glory Days Grill offers a full bar, to go services, catering and banquet/party facilities. Many locations have private rooms and patios available for parties and events.